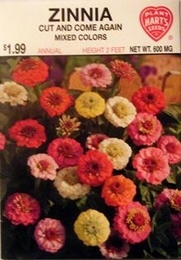 Zinnia - Cut and Come Again Mixture, Zinnia elegans. Fully double 2 1/2 inch flowers on long stems. Beautiful blend of colors, including bright scarlet, pink, yellow, salmon, white, and others. Continuous bloom from early midsummer to frost. Zinnias prefer warm weather, rich soil and full sun. Water as needed by soaking ground around plants. May be sown up until the end of July. Thinning - when plants are 2-4 inches tall thin to 12-15 inches apart.